No, this is not the post where I start telling of a bunch of crazy secrets i've been hiding! 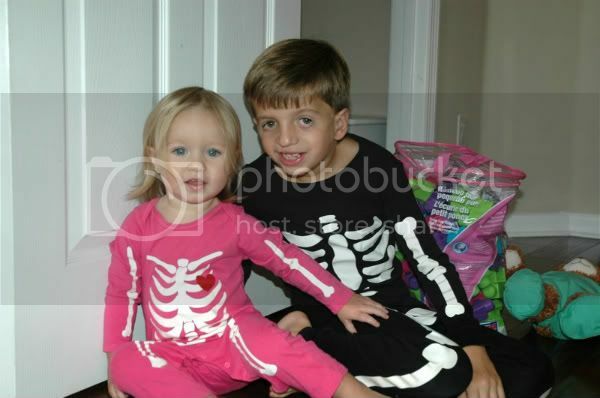 It's about my 2 skeletons playing in the toy closet today. Andon had these jammies from last year and today we were walking through the store and saw this pink pair. He insisted that Sis have them too. Adelyn adores her big bro. Her new thing is giving kisses and we all LOVE it. Here she is laying one on Andon. After this she immediately came to give me one. Then Daddy heard they were being handed out and came out of his office to get one too. We've got to make sure nobody is being left out! Not too soon after all the happy brother and sister play, Adelyn spotted a ring pop sitting on the kitchen table all by it's lonesome. So, like any smart woman she took matters into her own hands and climbed up there and got it. 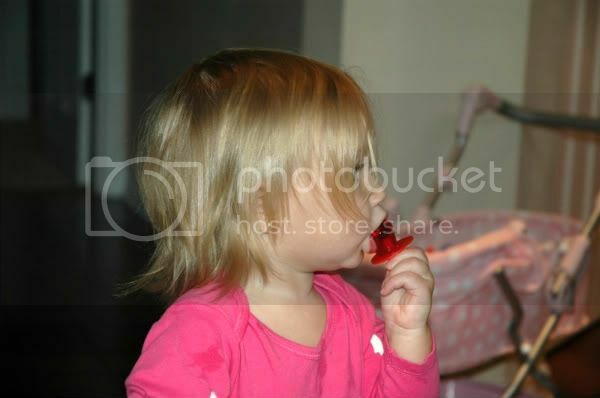 But it wasn't long before Andon spotted her licking all over his ring pop and took it back. Sorry girl, one day you'll get your very own ring pop! oh my word... too cute! She is looking so grown up!